It’s that time again, time for another magical story from the Santa Fun Stories series! Ollie the Elf has to get ready for bed, but he doesn’t want to. Will he be a good little elf for Mama Claus, and get ready? 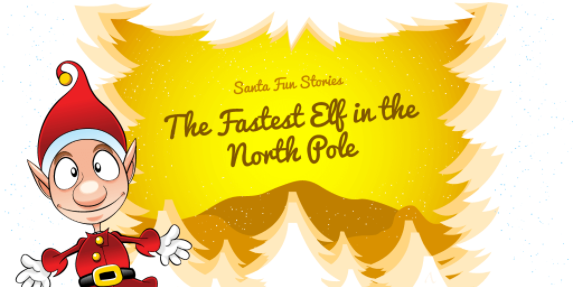 Here’s the next story from Santa Fun Stories! Ollie the Elf is getting ready for bed. Ollie doesn’t like getting ready for bed, he would rather stay awake and play all night long. There are a lot of different things that Ollie needs to do before he can go to sleep. 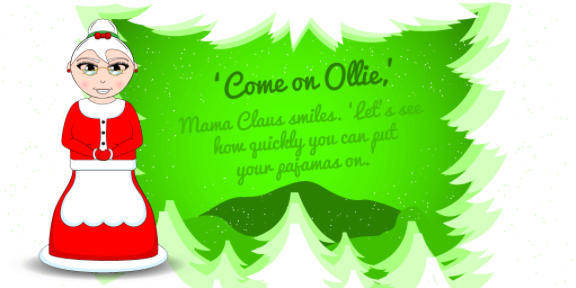 Mama Claus usually has to help Ollie because sometimes he forgets what he needs to do. First of all, Ollie has to get dressed into his pyjamas. He has blue pyjamas with little red and blue candy canes printed on them. Ollie loves his pyjamas but he doesn't like putting them on when it’s bedtime. Mama Claus helps Ollie to get into his pyjamas. ‘Ok, ok, ok, say ready, steady, go!’ Ollie shouts excitedly. ‘Ready… Steady… Go!’ Mama Claus says loudly. Ollie runs across the room and pulls his pyjamas on with lightning speed. ‘I'm finished! Mama stop timing! I finished!’ Ollie yells. ‘Well done Ollie! 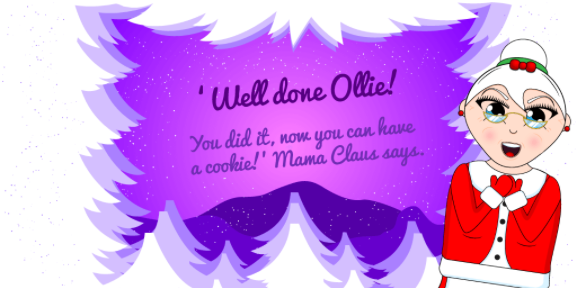 You did it, now you can have a cookie!’ Mama Claus says. After getting dressed for bed, Ollie has to brush his teeth and wash his face. Emilie the Elf also has to brush her teeth and wash her face. Usually Ollie and Emilie have a race to see who can finish washing their face first, but Mama Claus always has to be there for when they make a mess. Tonight Ollie doesn't want to brush his teeth or wash his face. Emilie and Mama Claus decide to tell Ollie that if he washes his face really fast, tomorrow he will be the fastest elf in all of the North Pole. ‘Yeah! But don't tell anyone else or they'll all be washing their faces!’ Mama Claus says winking at Emilie. Ollie washes his face so fast that he splashes soapy water all over the floor. Ollie gives Mama Claus a sheepish look and picks up his toothbrush. 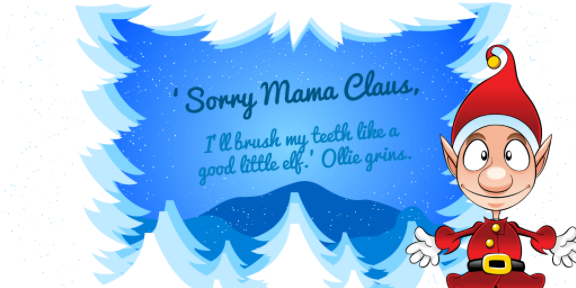 ‘Sorry Mama Claus, I’ll brush my teeth like a good little elf.’ Ollie grins.